I think they can be so fabulous! Just look at the model above. She looks both elegant and ready for action. What a super hero! I was scarred and prejudiced by memories of the running shoe with work wear in the ’80s. Melanie Griffiths was never my fashion icon. I was a snob who noted that I could always tell the American tourists by their footwear. I get it now. Of course they needed comfortable footwear, they were here to do a lot of walking. At the time I wore black Dr. Martens and felt that was the only cool look. (Please forgive me, I was young and under some bad influences). There’s a whole separate category, often referred to as fashion trainers (or running shoes, if you prefer). These are not designed for running, so much as variety, looking good and being comfy. And they are not just for the young. Converse high tops may be a little lacking in support for my feet but I find Nike Roshes very comfortable. These Roshes look great with a patterned day dress. I particulaly like that they have a colourful sole. Many coloured sneakers have white soles which can mess up the colour scheme. White could have worked with this dress print but great to see a solid coloured shoe. Here’s another solid shoe making that Grellow (grey + yellow) statement that I love. Doesn’t it look so much better for not having a white sole? 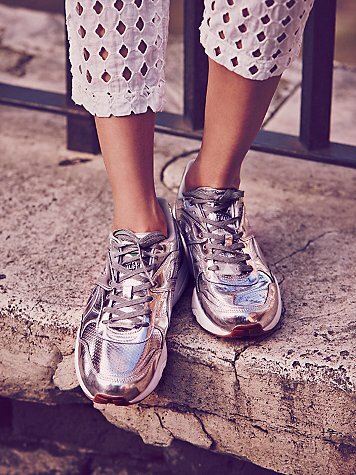 This next pic from Free People is a funky way to wear sneakers with summer whites. Less predictable than the all white tennis shoe. Although, a classic white trainer can add some edge to a pretty dress to stop it from slipping too far into night gown territory. With my preference for loose, pleated lawn dresses in the summer, I am often in danger of falling into sleepwear looks. I have learned through repeated mistakes that shoes should never be bought over the internet. Apart from the obvious comfort factor, I need to try shoes on with likely outfits. A chunky or light profile can really make or break a look. I plan to make a trip to Zara to try on these £50 grey lace ones. If they are as comfortable as they look, I think they may work come home with me. Yes I’m a lot less “judgy” about the running shoe thing too. Like how you can customize your own Nike Roshes. I only wish there were more colour/print options especially for the soles. Converse are a classic and you can always use those gel inserts with an arch. I will never give up my Stan Smith Kermits. Not because of the frog factor which does lend an over-sized toddler vibe but because the green is so damn happy. Me and Marc Jacobs:) Love your recent posts… Looking forward to Velvet Swan! Susannah, I think you are right, I need some gel innersoles for a pair of Converse. I’d love to customize my own Roshes. I keep visiting the site and playing with it. I want all the shoes!